Motion Infographics is a flexible visual tool that is now widely used in media. It comes from the terms "Motion" and "Infographics" in English and uses graphics and animation to create a scene in which changes or movements occur. It may also be accompanied by sound effects or music. In this course you will learn about Motion Infographics, we will learn the difference between it and Animation. Through simplified videos we will explain how to produce Motion Infographics from the first stage to the animation. We will look at the steps needed to develop your idea and how to incorporate your scenario into the scenes it produces. We will learn about the free tools available on the Internet that help produce Motion Infographics and the professional software needed to produce Motion Infographics, and how to utilize different programs such as Illustrator, Adobe Audition and After Effects to draw scenes and introduce audio for the Motion Infographics. How do I start learning Motion Infographics? Dr. Mohammad Shaltout is passionate about introducing modern technologies in education, and in measuring their impact on the education process. His work also seeks to bring together visual arts and e-learning to help students and motivate them. He obtained a master’s degree in Educational Technology from the Graduate School of Education at the University of Cairo, and a doctorate in E-learning from the same institution, with a focus on the impact various animated films can have on the education process. Dr. Mohammad has trained over 20 rapporteurs at the master's level for Educational Technology and E-Learning in Egypt and Saudi Arabia. He has also given many lectures on visual arts and e-learning through his YouTube educational channel; and has published over 20 articles in journals and international conferences concerning e-learning, infographics, cloud computing, 3D printing, and other fields, and over 20 articles on e-learning and visual arts. 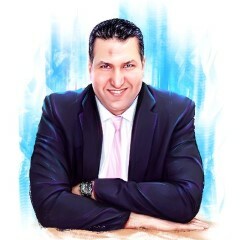 Dr. Shaltout has organized over 70 training sessions on e-learning and visual arts in various Arab countries.